In George Orwell’s novel 1984,the main character, Winston Smith, works for the Ministry of Truth where his main task is to modify the language, making it easier for the system to not only control people’s physical lives, but also their thoughts. This project is inspired by this dystopia, since elements of it are happening in our lives right now – politicians use certain words to convince people that how they see the world and what they want to change in society is the truth. Language does shape our reality. A way our language is rich and subjective is for example through the use of euphemisms. A euphemism is a mild or pleasant word that is used instead of one that is unpleasant or offensive (Merriam-Webster). This could for example be when you say “kick the bucket” instead of “to die”. When talking about politics, this phenomenon is called newspeak. However this rhetorical ploy often happens unnoticed and we are influenced by politicians’ word choice everyday. 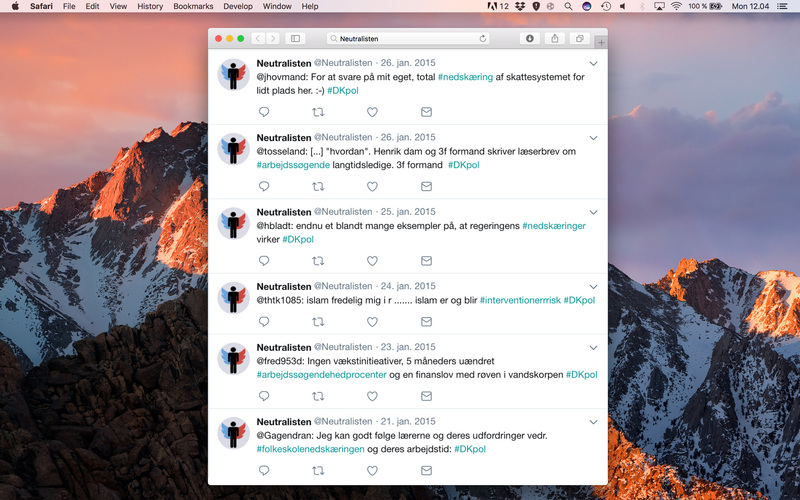 Neutralisten is a Twitter-bot that aims to make the political use of these words more visible, by engaging actively in danish political debates on Twitter. 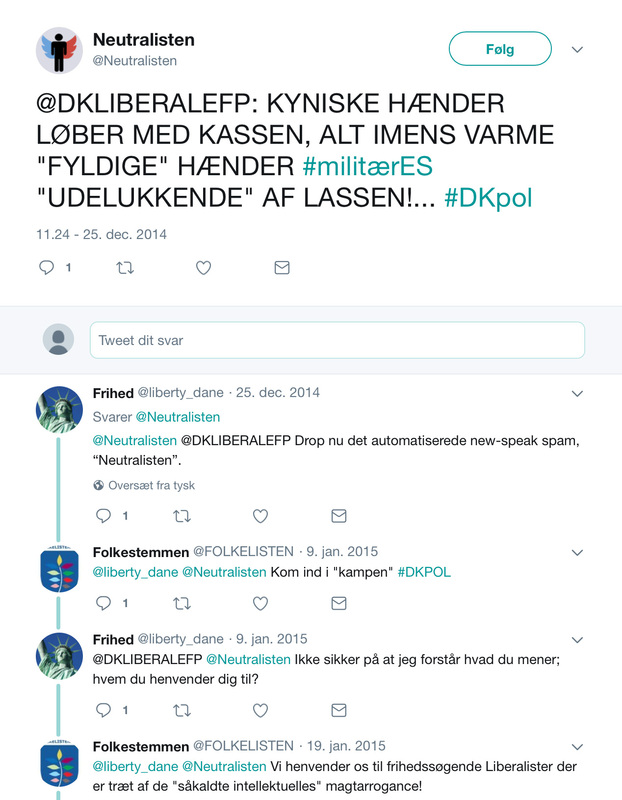 The bot searches for tweets under the hashtag #dkpol – being the hashtag for Danish politics. The bot will then look for politically charged words in the tweets, and when a word is found the bot will change the word to its oppositely charged equivalent and retweet the messeage. 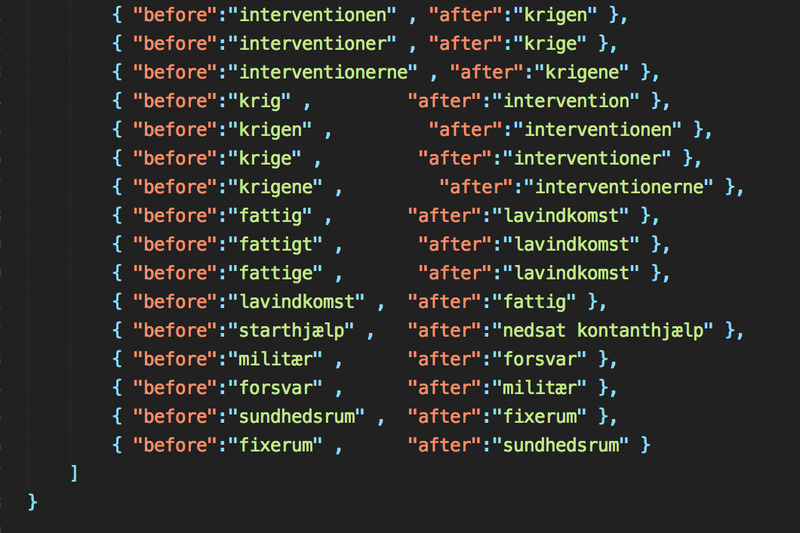 So for example if a tweet with the hashtag #dkpol contains the word “reform” our Twitter bot will retweet it but change ”reform” to “reduction”. 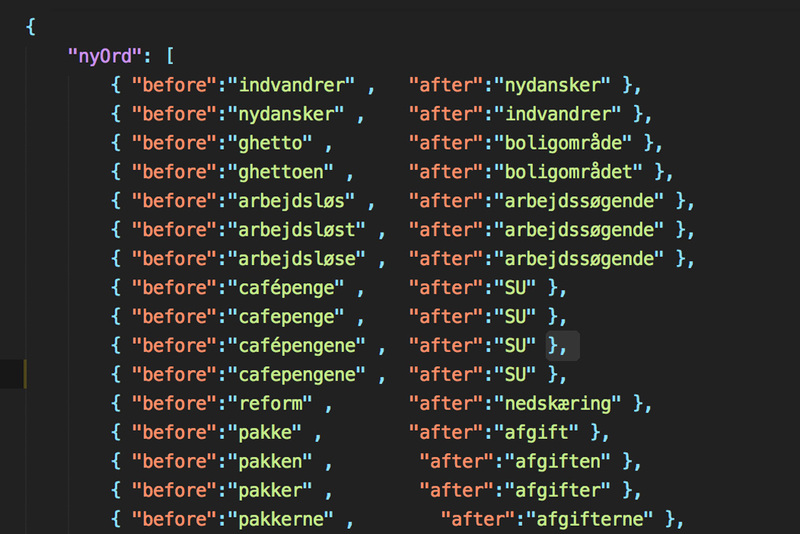 In danish political reforms and reductions are often words used for the same thing, but they are charged in two different directions for two different purposes. The list of words were manually created by searching for words that politicians often would charge to support their political agenda, however this also had its challenges. Language is very fickle and therefore is very hard to take into account in an algorithm; it could be argued that the bot would have to be context-aware to work optimally. On the other hand, it could be argued that a perfect algorithm would ruin some of the experience, as the quirkiness and nonsensical nature of the tweets are actually a factor in provoking the thoughts of the audience, which was the primary target of the project. Neutralisten made 1500 tweets in three months and the goal for this has been to explore a more playful way to give attention to the use of politically charged words, and show how a sentence can change its meaning and purpose by charging a word in a specific direction. 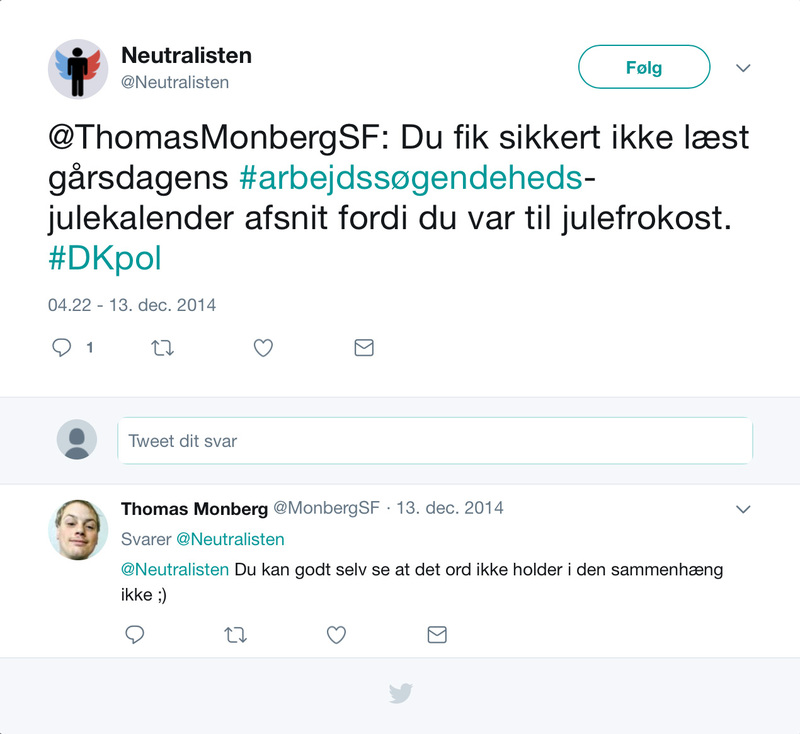 We want this to work as a critic of the political charged words in Danish politics. Hopefully this bot also will make it more visible for people.